Friday he took a half day to spend some extra time with Sarah and so he sent me off for a girls night with some friends. We ate at a place in East Memphis called Patrick's. I ordered their special sandwich, The Mempho. It looked like a bad idea, but I'm a sucker for house specialities so I gave it a try. It was a pulled pork sandwich with caramelized onions and provolone cheese (which sounded great) that was topped with mack and cheese and then grilled. I don't even want to know how badly that thing clogged my arteries. I was super starving so while it wasn't the greatest thing in the world, I did end up eating all of it because I was that famished. But I wouldn't ever order that again. Saturday was a cool and windy morning but it was a nice break from the freezing cold temperatures, so we went to the zoo with the Joiners. They brought their wagon for the girls to ride in. I think the girls both had a great time sharing snacks and trying to put things down the little black plug. 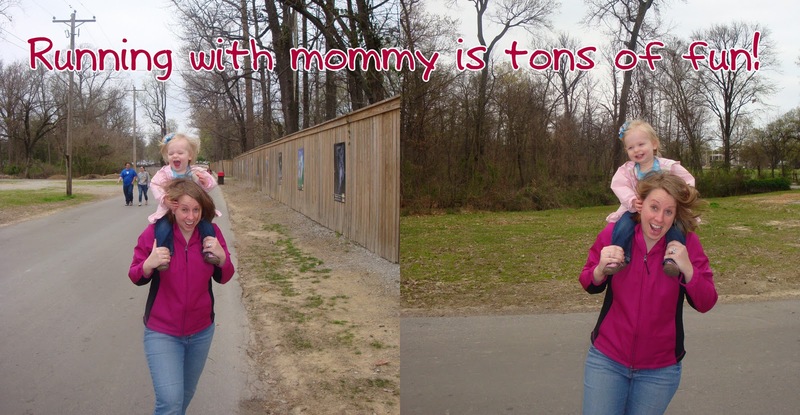 Though, going to the zoo with Elsie Tate makes me feel a little bad. Elsie Tate is just leaps and bounds more verbal than Sarah. And though I'm crazy type A, I really have tried not to compare Sarah to others and worry about things. But Elsie Tate is pointing out all the animals and naming them and telling you what sound they make. Sarah can't name any animals yet though we read her animal book at least 5 times a day, and the only sound she knows is quack (which she'll say no matter what animal you ask, so we generally just ask about a duck when people are around). After the zoo, Chris sent me to get a pedicure with Laura while I wrangled Sarah for a nap. Have I mentioned how fabulous he is? 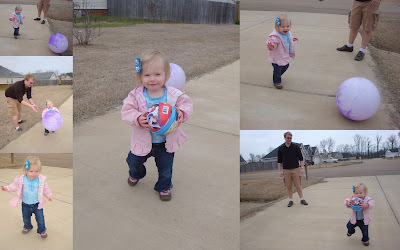 When she finally took a short nap and was up again we went outside to show Sarah the new outside play balls we bought her. She loved them. She toddled all over the drive way picking them up and throwing them. However, the cutest part was when she was done. She started walking to do the front door. I said, "See ya later", and she turned and waved and kept on heading to the door. She crawled up the front steps, walked to the door and then waited. She turned around and looked at us like, "are you coming?". This girl knows what she wants! Such a great weekend! I'd like to say we've got another one coming up, but I think Chris is cashing in the points he earned because he scheduled a nerd fest Friday night (what I call his guys night out) and is going to do manly man things at the lake house with his dad Saturday. So it'll just be Sarah and me all weekend. Play date anyone?